Rev. 6:1 –Then I saw the Lamb open one of the seven seals, and I heard one of the four living creatures say with a voice like thunder, “Come!” 2I looked, and there was a white horse. The horseman on it had a bow; a crown was given to him, and he went out as a victor to conquer (HCSB). Now that Jesus has received the scroll – possibly the title deed to the earth – He opens the first seal. When He does, one of the four living creatures speaks with a thunderous voice, “Come!” (or, possibly, “Come and see!” or “Go!”). But to whom is he speaking? John already is nearby and sees what takes place. If the command is to go, where is John to go? The living creature doesn’t say. Some commentators argue that the living creature is calling on the Lamb to come; we see throughout the New Testament a strong desire for Jesus to step into the clouds of heaven and return to earth. Interpreters who hold this view see Jesus as the rider on the white horse. Others believe the command to “come” or “go” is directed at the riders on their respective horses. This view seems consistent with the text and does not require Jesus to be the rider on the white horse. In any case, the living creature’s thunderous voice lets everyone know something significant is about to happen. One other note about the living creature: Some scholars believe the living creatures speak in order – the first, like a lion, for example (see Rev. 4:7). The creature’s bold proclamation is like a lion’s roar and ushers in a succession of great revivals beginning in Jerusalem and spreading throughout the world. But this framework is hard to match to all four horses and their riders. It may be better to understand that the living creatures share in the responsibility to pronounce the stunning events to follow; the order of their speaking is not made clear to us and therefore is not of great significance. But who is the rider on the white horse? We already have mentioned that some commentators think this rider represents Christ, the sword-wielding “Word of God” who rides a white horse in 19:11–16. However, this rider is armed with a bow, which is significant to first-century readers. The Parthians, a frequent enemy on the Roman Empire’s eastern border, are outstanding bowmen, so it’s more likely that this rider symbolizes the quest of neighboring political and military powers to expand their empires, leading to war (red horse), famine (black horse), and epidemic disease (pale horse). 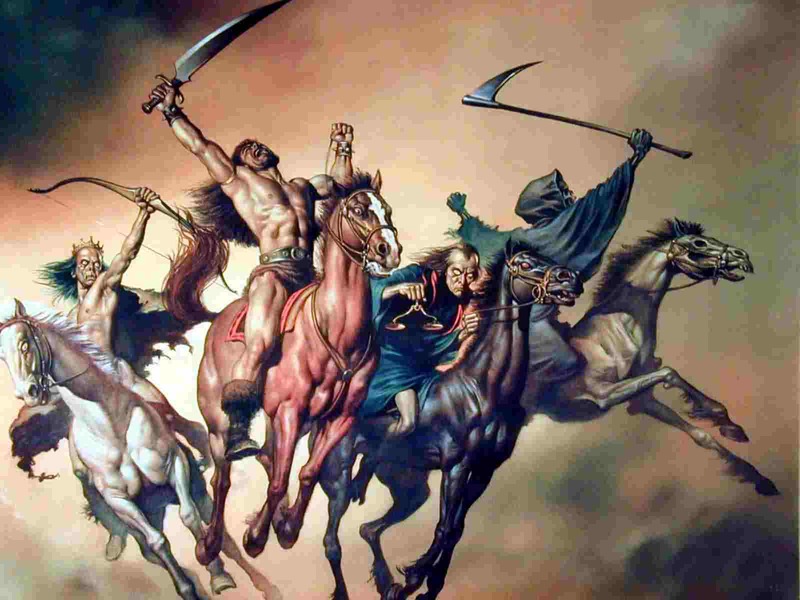 Still others – predominantly futurists – think this rider on the white horse represents the Antichrist. So how should we see the appearance of the white horse and its powerful rider? First-century Christians certainly could have seen this as an indication of political and military battles that ultimately lead to the fall of Rome and the destruction of the temple in Jerusalem, thus fulfilling Christ’s promise to deal harshly with those who persecute His followers. But political and military conquests have been the norm throughout human history, not just the early days of the church. Even more, the New Testament warns us that the world will become more evil in the days preceding the return of Christ – unprecedented days of persecution and wickedness. The futurist says we have not yet seen these days. Which view is correct? Or are they both right? Perhaps a better question is: What does God’s Word say to me today? The truths of Revelation remain the same today as they were 2,000 years ago. We know that evil will run rampant throughout the church age; that Christians will be persecuted; that antichrists will oppose the Lamb and seek to take His place (see 1 John 2:18-19); and that one day the Lamb of God will appear as the Lion of the tribe of Judah to make things right. Let’s keep that perspective as we explore a variety of views about the order of events unfolding in Revelation.